Safety Cans There are no products in this category. 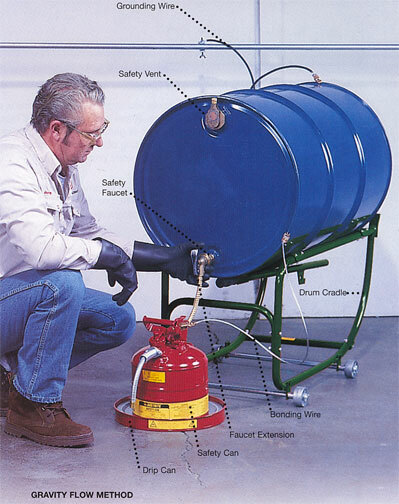 Justrite Safety cans for use with flammable liquids in the laboratory or workshop. Cans are available in capacities 9 litres and 19 litres in steel or polyethylene. Different models offer tap mounting positions at the top or bottom of the container for bench top or shelf mounted use and a version that is cradle mounted for ease of pouring. Polyethylene cans have built in anti-static feature allowing cans to be earthed with an anti-static wire. HIgh-density polyethylene (HDPE) disposal cans provide superior chemical resistance and leak protection. Spring loaded sealed cap, normally closed, automatically vents between 3 and 5 psig. Stainless steel handle and hardware with latch-catch system hold the cap in the open position for easy filling and pouring. Large-mouth opening features a built-in stainless steel flame arrester to guard against outside ignition. The broad-base design provides stability and resists accidental tip over. Model 14265 with built -in polyethylene fill gauge indicator pops up to warn up that the container is almost full.